Bamboos are evergreen plants popular in many parts of Asia. They are fast-growing and can be invasive. Before my family migrated to the United States, our old house had a large backyard with many wild bamboos. Some of them were significantly sized in diameter. 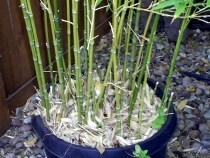 Due to a smaller backyard, we currently grow bamboos in pots to limit its size growth. 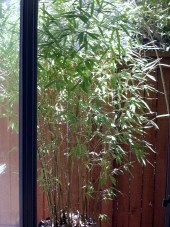 For aesthetics, we placed the potted bamboos behind the windows looking into our living room and kitchen. This is an attempt to imitate scenes from ancient paintings of bamboo and to instill a sense of calmness. Our visitors often comment positively about the placement. Bamboos almost never bloom flowers but when they do, it is seen as a bad omen or a harbinger of something negative.